Six years ago, I chose to bid from my current high school position in our district to a brand new high school that we were building. Included in that position that was being a part of a year-long planning team before the school opened. During that year, we taught at our existing school but also met frequently to be involved in every aspect of the new school–and ultimately, I had a large part in defining the entire music program at that school (I also had a band colleague in this process). In my last year, we managed to put a Music Technology course on the program of studies, although the course did not have enough enrollment to run (see below). I became convinced that music technology was a needed (an interesting) element to add to the curriculum. We also wanted to consider adding courses such as Jazz Band, Show Choir, and Drum Line. We built the music program with the idea of, “Build it and they will come.” Even if the courses did not run, they were on the books and could run when they needed to run. Over the first four years of the school, we ran a number of these classes; typically two bands, three choirs, occasional classes in music theory, and regular courses at Guitar level 1, and the occasional level 2. We had a MIDI lab installed when we opened the school, a seventeen seat lab with a computer, MIDI keyboard, microphone, Finale (2010), and other free software (e.g. Audacity). The plan was to use this lab in conjunction with our Music Theory courses. Ultimately FTE ratios became a challenge. In music courses, the minimum cap number of 25 was usually enforced. Any music teacher will tell you that FTE is a deceptive number. There are always courses where FTE is allowed to dip “below” that magic number of 25, and if the district ratio is at 32.5 (as our is), no one is ever concerned if music or physical educaton teachers have a FTE ratio far above that ratio. Counselors I talked to considered these courses “black holes” where you could place students and lower the FTE for other teachers. Ultimately, if your program is a “favored” program of your administration, the administration runs those courses regardless of FTE. As we opened the school, both the Band and Choir were below the “actual” FTE requirements, partially because we opened under the last year of a four-period day where students were strongly encouraged to take two years of math and two years of foreign language in one year while they still could. Choir began with 35 students and band with 105; by the end of my four years there, choir was at 156 and Band at 88 (there was additional growth for next year). I don't want to make the case that we were overloaded with students, but I do want to point out that an additional class or two could have been added, only further justifying our FTE. One year I taught (under the four period day) three choirs and another course (music theory or guitar). But that only happened in one year (year 2, I believe). Logically, courses such as Music Theory are intended as a place for your most gifted musicians who want to prepare for college (I also found that a number of guitar players not in traditional band/choir/orchestra would take music theory to learn how to write music). We will run an AP course of 15 students for a high level science or math course for students wanting to pursue those fields in college–but doing so in music was a hard thing for our administration to justify. Furthermore, it became clear that the MIDI Lab was a poor investment; the MIDI Lab only had 17 work stations, and if you needed a class of 25 to run a course, what do 8 students do while the others work on the computers? As I have written about in the past, I left that school last year, and have taught this year at a middle school in our district which is 1:1. I will be writing about those experiences in the weeks to come. Yesterday I was visting with another teacher in our district, and wondered if my former schools was going to be offering any of the comprehensive music courses we created. I looked at the district program of studies, and all of our “comprehensive” courses no longer exist at that school. To be clear: the program of studies is impacted by the staff at each school, and they have input on what courses are offered. It is possible that the new teachers had no interest in offering those courses. Many music teachers consider themselves specialists: “I only teach ______.” Many teachers do not even want to consider teaching theory, history, guitar, or music technology as a separate course. I understand that point of view, but one of the things I have learned in my educational path is that schools need to offer more than band/choir/orchestra. You might disagree, or you might not feel equipped to teach such classes. But the end result is that you CAN teach those classes. You are a music educator–you are first and foremost a generalist, a common practitioner, and a specialist in your field second to that. If FTE is a factor in your teaching position, why wouldn't you want the FTE from guitar or music theory to keep you at 1.0? Sometimes we are afraid that we will lose kids from traditional band/choir/orchestra if we offer other courses such as “guitar.” You might lose some kids to those classes, and you can take steps to protect yourself (don't make guitar meet an Arts credit–making the course a true elective, only offer it to upper classmen, etc.). But generally, my thought has become: if a kid is in music, taught by a music teacher, they are still in music. MENC (now NAfME) used to say, “Music for every child, every child for music.” When 80% (or more) of high school students aren't in music when band/choir/orchestra are the only options, we're missing a lot of kids, and there is huge potential for growth. Again, I don't know if the new teachers simply didn't want to teach those courses (which didn't always run), but the removal of those courses from the offiicial “program of studies” also shows that the administration of that school did not share the same vision for a comprehensive program in music education. Otherwise, you could simply leave the courses in the program of studies but simply not run those courses. So it is yet a further validation that my decision to move (first and foremost for my family and to work in a 1:1 situation) was the right move. Let me be clear: I am in total support of band, choir, and orchestra in our schools. I love classical music, and I think those programs are relevant for today; I am not sure that our students (or their parents) always agree with us. So, keep offering those traditional music courses, but also consider offering non-traditional courses for that other 80%. But: would you be willing to teach a theory course, or a guitar course? 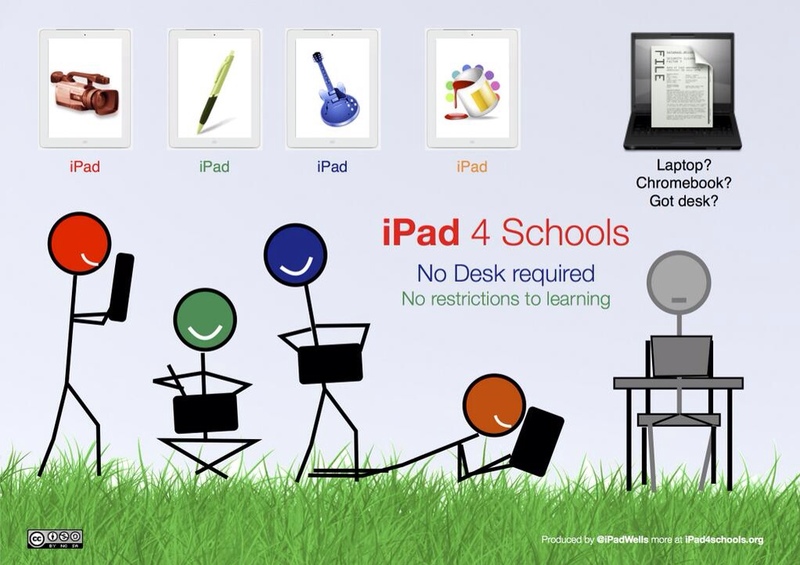 I was inspired last night by a new poster by Richard Wells at ipads4schools.org. The picture appears below and says so much, so simply (I have asked for permission to share this poster on my blog and in my books on Thor iBookstore). As a very important side note, Richard has a ton of wonderful iPad resources on his website. 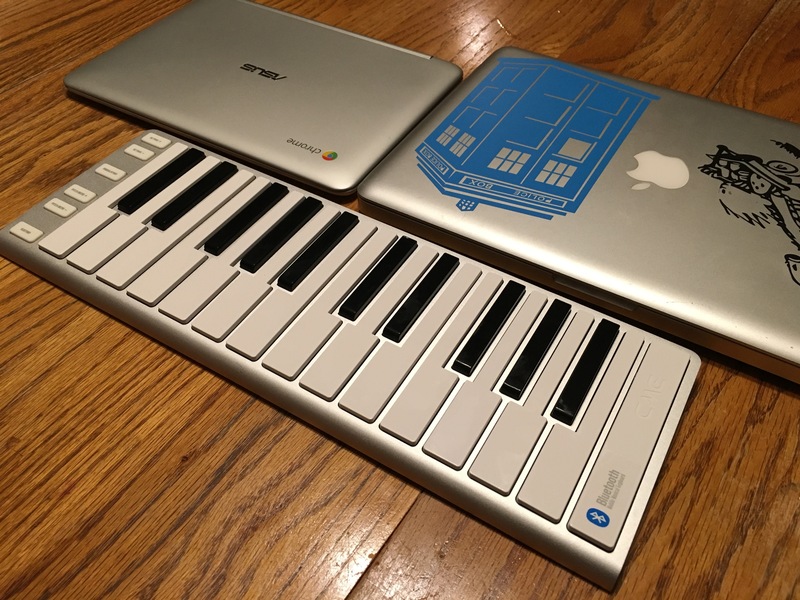 I find myself continually speaking out against notebooks and Chromebooks, because they just don't fit in music classrooms (applications, SAMR, and other topics just further the argument). Clamshell computers leave music “out in the cold” when it comes to technology. As a result, I began drawing this image in response, really in alignment, with Richard's poster. It took two hours to draw my stick figures in ArtStudio on the iPad (the background is a real stage–I didn't draw it). Enjoy! This is Part 2 of a continuing series that is documenting my process of creating a secondary-level Music Technology Class featuring the iPad. Your thoughts and comments are welcome…please send them to the e-mail address on the right side of this page. 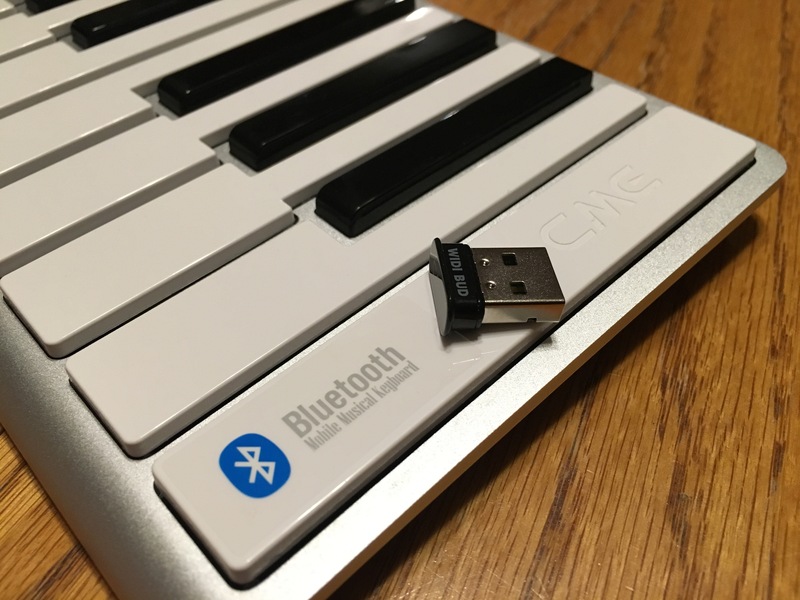 A music technology course would allow music staff to reach the musical needs of the 80% of the student body that does not participate in traditional band, choir, and orchestra offerings. 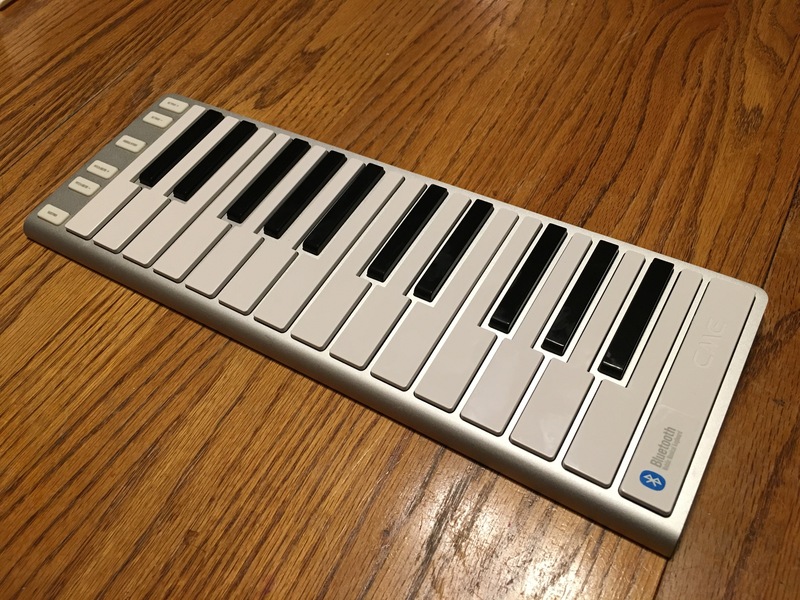 Utilizing the iPad, GarageBand, and other specific apps, students will learn skills in basic theory (through basic chord progressions), and to utilize digital instruments, loops, and samples to create finalized recording projects. Students will be required to compose and create music for video footage (exporting to iMovie), as well as to evaluate their final works. Rationale: Some music apps are very large (e.g. Notion for iPad is in excess of 1GB, some iBook textbooks are over 2GB. 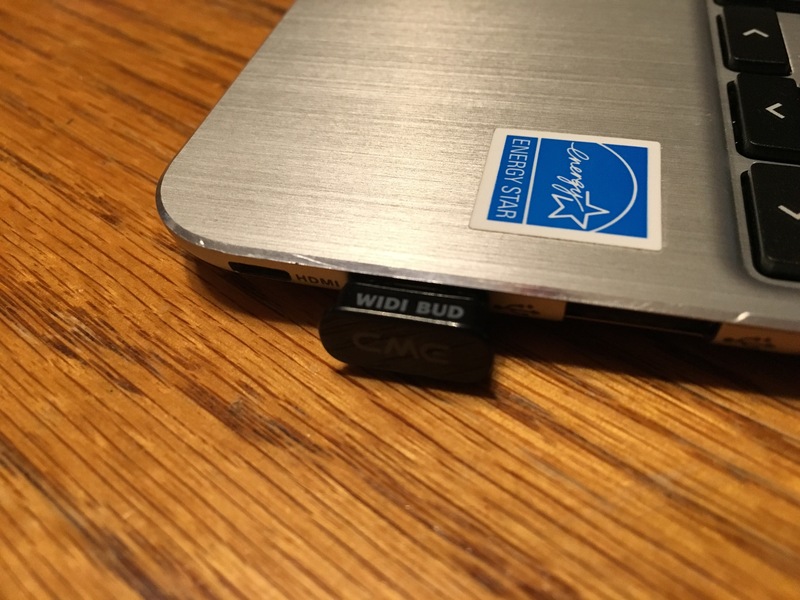 32GB allows for ample space on the devices for audio and visual student work. The instructor may need to keep many files–including completed student files–on their iPad. The 64GB iPad gives the instructor the greatest amount of flexibility. If you wish to wirelessly project from the iPad to an external source, you need an Apple TV. An amazing solution for a very large LCD screen that would provide a very bright image in any light; at $4500 the TV is on par financially with the brightest professional projectors, and still less than many IWBs. An LCD TV should get at least 100,000 hours of use. One example of a HDMI LCD projector solution. The bulb will eventually burn out at 2000-3000 hours. Note: no textbook is required/requested; a textbook for the class could be made using YouTube videos (see http://www.classwidgets.com) and other materials by the teacher. A traditional MIDI lab or music technology lab could not provide a lab of 30 computers for $30,000–not to mention the additional costs of software, desks, chairs, projectors, MIDI keyboards, speakers, microphones, headphones, and so on. A music technology course I just visited was started with a grant of $140,000. Over four music technology programs could be started using iPads for that same amount of funding. Although the iPad is not a full desktop replacement, the device has great potential for education and music education. Combined with its form factor (size and portability), battery life, features (instant-on and audio-video recording), and flexibility (limited only by the apps available for the device), the iPad can be used as the complete tool for a music technology course. GarageBand for the iPad allows for the live recording of music, either with “played” instruments or with “smart” instruments. GarageBand can also be used with external MIDI instruments (not included in this proposal) and to sample new sounds. It can even be linked with three other iPads for a “jam session.” Apple, Inc. is touting GarageBand for iPad as a way to make music without knowing anything about music–what better tool to use for music education? Other apps, such as Notion, allow for the actual composition of music using music notation. 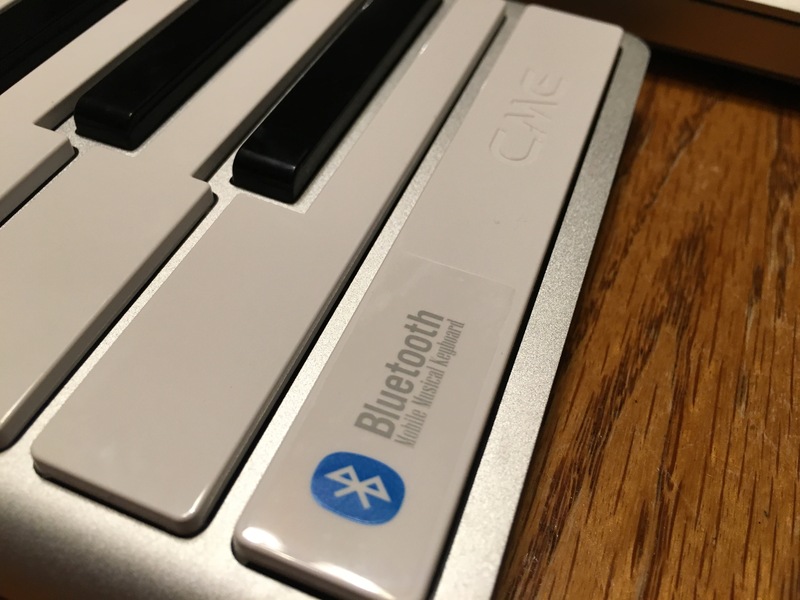 In addition to the appeal of the iPad itself, the iPad-based Music Technology course is also appealing because of its great flexibility. 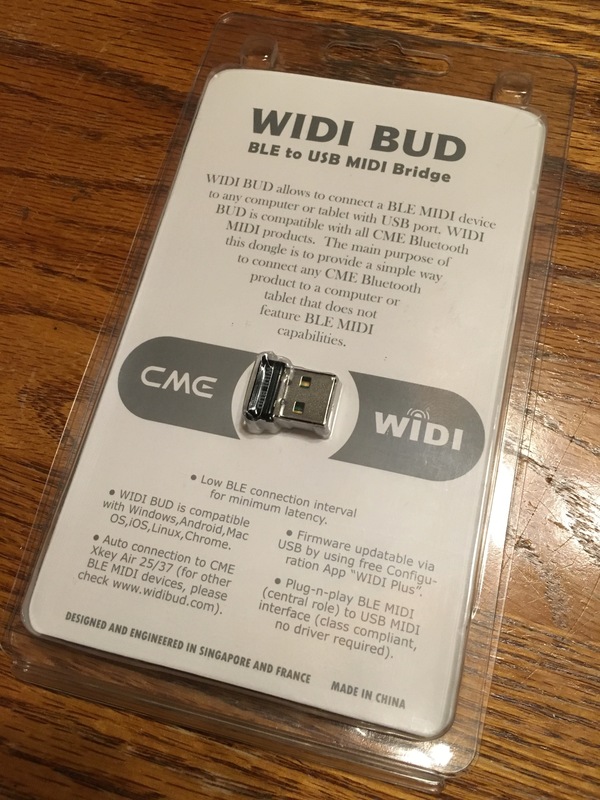 You can create a MIDI lab in any space, without any other necessary components (monitors, speakers, MIDI keyboards, computer keyboards, speakers, etc.). You can teach REAL music, study REAL music, and make REAL music. 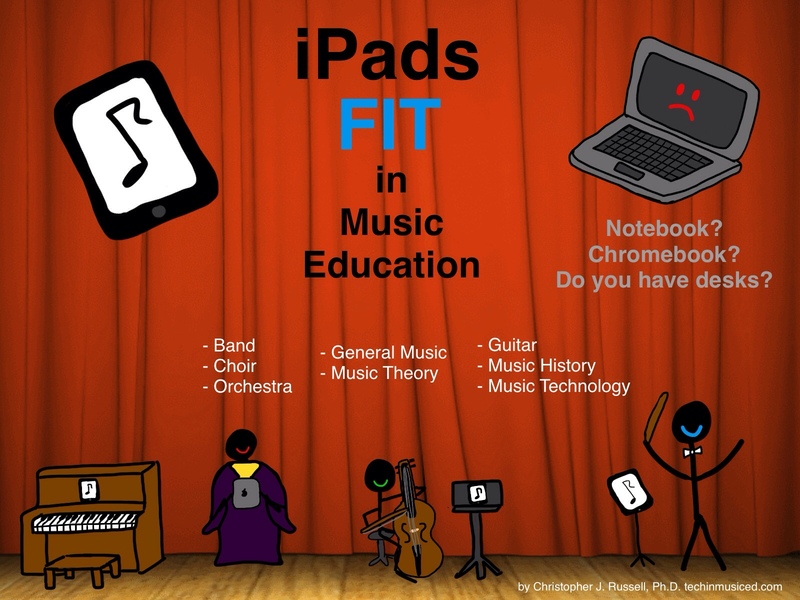 And the apps requested in this proposal also allow for the use of the iPad in other ways (writing papers, giving presentations, or even in other music courses). The iPad does work best in 1-to-1 situations, but can be adapted for lab sets (such as this proposal). Students COULD have the opportunity to check out an iPad overnight or over weekends, but school policies would have to determine the process, and there could only be one class “needing” the iPads at a single time. I recently had a chance to visit a local high school that offers a music technology course. 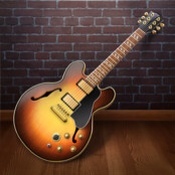 The course focuses on GarageBand and its many resources for Mac. I want to create a course similar to that course, but I want to use the iPad instead. I foresee a course that would have a bit more in the realm of music theory for students, up to the point of understanding basic rules for chord progressions (this will facilitate the use of GarageBand’s chord tools). I have begun the process of following a number of “techie” music teachers (Twitter and blogs), and two things hold true. First, these educators are highly collegial. Second, they universally see themselves as music educators, not as a specialist in a specific area of music (although many of them are master teachers in a band, choir, or orchestra (BCO) situation). Universally, every one of these educators is concerned about the 80% of students who do not take BCO courses at the secondary level (Your school may have a different percentage, but on average, about 80% of secondary students are not in performance classes). At our school, we’ve added Guitar (Levels 1, 2, and 3), Beginning Music Theory, AP Music Theory, and Music in History and World Cultures to meet the needs of non-BCO students. Thus far, we’ve offered Guitar Level 1 three times, Guitar Level 2 one time, and Beginning Music Theory one time. We do get a small number of students who sign up for the other classes, but the administration kills those offerings because they do not approach the 32.5 student ratio as outlined by the district. We have even had some BCO offerings eliminated due to that same 32.5 ratio. Staffing has been affected as a result–in one of the state’s newest high schools, in a metro area. Meanwhile, we have a increasingly large number of our top students who are taking STEM classes (Project Lead the Way Biomedical and Engineering) and AVID, and a number of students taking remedial English and math courses. When students take STEM, AVID, or remedial courses, they have no room for music. We also compete with foreign language as many students are required to take four years of a language to be accepted at prestigious colleges and universities. Ultimately, when your adminstration and counselors stress that students need to take specific courses, students take thouse courses. How do we get more of the 80% (or more) students that are not in BCO offerings to come to our music program? I think the answer lies in a music technology course centered on the iPad. 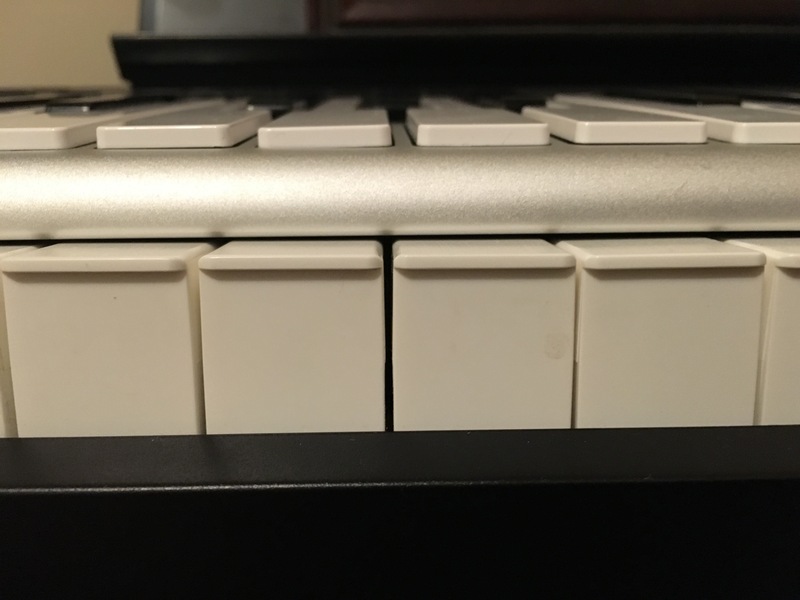 This is the first post in a sequence of posts I’ll be writing as I develop a course proposal for a music technology course that could be taught at the high school level (and perhaps the middle school/junior high school level) utilizing the iPad. I’m happy to share these thoughts (and the final proposal) if others wish to adopt (or adapt) a similar course. My only request would be that if you have feedback, please send me an e-mail message. I would also hope that you would allow me to post some of the feedback that you have to offer. Yes, I am fully aware of the greater functionality of the desktop version of GarageBand. At the same time, I want to make a replicable course that uses technology that is of great interest to students (and very applicable for 1-to-1 situations). The iPad is a piece of technology that is of high interest, is relatively affordable (compared to a lab of iMacs), and is extremely portable. Any classroom can become a music technology lab with iPads.